There was a time before the Internet put thousands of real-world user reviews at your fingertips that you would have to rely on publications like Consumer Reports to help sort out the bad dishwashers from the good, the most reliable VCRs from the tape eaters, and the sweet rides from the lemons. Those days are officially over. Shock Top, a CR Best Buy, has big malty flavors of molasses, caramel, and honey with relatively low bitterness and some sweetness. While Consumer Reports puts the beer (which I’ll assume is their flagship Belgian White) at the top of the “craft” beer food chain, the uneducated dolts over at BeerAdvocate – you know, the beer geeks who obsessively scrutinize and catalog every beer they drink – give it an overall rating of 70, one point away from being classified as “Poor.” Boy – what do they know?! They should leave the heavy lifting to the experts over at Consumer Reports! Sweet orange up front, then I get some spice that must be the coriander. The orange flavor tastes very artificial. I guess the wheat is there, but not the way you’d want it to be. It finishes with some off tasting grain, corn, and fusel alcohol flavors that help you remember that you are drinking an AB product. Whereas, a better witbier would help you forget that you are imbibing alcohol. Sounds pretty awesome, Consumer Reports. Way to go, geniuses. 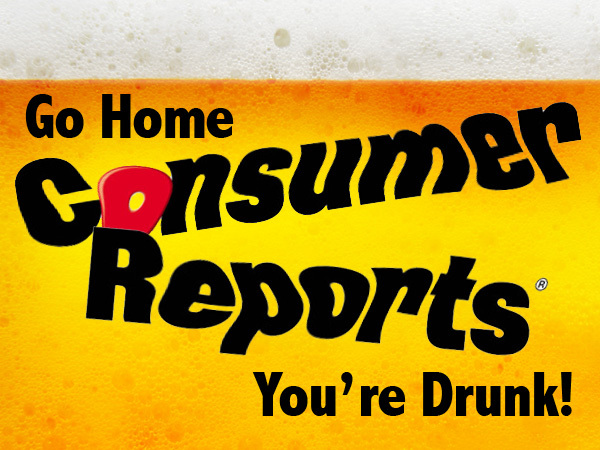 Now some of you might say I should cool my jets – Consumer Reports is for a mainstream audience, not for beer geeks, and so they’re going to gravitate towards more crowd pleasing offerings. I get that, but the fact that they’ve labeled an imposter brand as a can’t-miss-craft-beer makes me crazy. This is exactly what Big Beer wants to happen – have people buy their craft beer clones thinking they’re getting an authentic product made by an independent brewery. The fact that Consumer Reports, in what I hope is their ignorance, has taken this bait and disseminated it across their publishing empire adds fuel to this unholy fire. It also makes Consumer Reports look pretty stupid among people who know a thing or two about the beer industry. If they’re wrong about this, where else are they off the mark? Because of the miracle of online user reviews on everything from cars to kayaks to Hello Kitty phone cases, I’ll happily never know. Goodbye, Consumer Reports. Thank goodness it’s no longer 1992. This seems like a pretty egregious mistake for a group as well read and respected as Consumer Reports. I’m no Nostradamus, but after this mess I’m guessing there will be some openings for “craft beer experts” on their staff in the near future. Man, I really thought Boone’s Farm was going to take the trophy this yea. Whats the word? Thunderbird! What’s the price? Fifty twice! Or maybe they’ll go for a little of Natty Bo’s Malt Duck. Here, here! I just posted this on their FB page. Uh oh – I hope they don’t get all lawyery about they logo treatment above! Eh, I’m pretty sure you’d be covered by fair use. Also, looking further at the original link, Shock Top was not the only non-craft beer they tried as part of their “craft” beer taste test. Kirkland Signature, aka Costco, as craft beer?! Very disappointing indeed, especially given that there is no shortage of actual craft beer in the U.S. right now. When I think of Shock Top, I definitely think of Best Buy as a similar brand. Yes, they are twins in tortured experiences, that’s for sure! The report even takes time to define what a craft beer is, according to the ABA, but still cites Shock Top as a craft beer. Unbelievable!! They also include Goose Island 612, Blue Moon and even Costco brand beers!! Hardly craft beers. You’re right to note that this is for a mainstream, largely uneducated audience and many brewers will admit that faux craft beers can help them in that they are ‘gateway’ beers for the uninitiated. But to put a non-craft beer at the top of their craft beer list makes the report null and void. It becomes a beer survey, not a craft beer survey. I caught that, too – the requirements were listed on the page, and they still included a handful of beers that do not qualify. Nuts. I also think that beers like Fat Tire, etc., are great gateways into craft beer for the uninitiated. We can do without Shock Top, Batch 19, Blue Moon, Landshark and all the rest, thank you very much! CP is appealing to the mainstream markets and appalling to the niche markets. Well if they’re this off-base in the beer vertical, it makes me think that they might wholeheartedly endorse exploding cars or name Irwin Mainway’s “Bag O’ Glass” as the Toy of the Year. Did they also review New Coke? I’m suddenly curious. Part of the problem here Consumer Reports’ raison d’être (kinda fun to write like a wine snob) is so that no one gets suckered by slick marketing hype. The other part of the problem is that there are legions of beer geex who wouldn’t be fooled, who can usually write better than this, and who would happily lend their Beer Geekdom to CR. The reviewed New Coke, saying it’s far superior to the classic version, but can’t hold a candle to the taste leader in their latest round up of premium colas, Sam’s Cola, found exclusively at that emporium of upscale merchandise Wal*Mart. these folks really know their stuff. I’ve always hated CR and firmly believe that if Ford marketed the Pinto all over again (pre-recall IED version), they’d give it their highest rating. Yes, they loved the Tata Nano, the world’s cheapest car, noting that beyond its propensity to spontaneously combust, the interior was cheery chic and the car promises frugal fun (and possibly a funeral). Consumer Reports was unique in that they weren’t swayed by advertising dollars, and actually used some semi-scientific criteria for the durable goods they were testing. Finding out which water heater lasted the longest and used the least energy, was of some value and objectively measurable. Same with measuring the number of dead prostitutes one could fit in the trunk of a Malibu, which was seven; again the number is seven. Measuring the quality of beer is deep in the territory of subjective, and a beer isn’t typically considered a durable good. I say typically since I’ve seen unopened cans of Billy Beer on eBay. Be that as it may, there isn’t much value in a Consumer Report on a beer, unless the average American doesn’t have a buck to throw down on a single can, and do their own test. Besides, what self respecting craft beer would ever dream of having their label embellished with “Best Beer according to Consumer Reports”? As if. Agreed, but if they’re going to do taste tests and proclaim winners, at least know what you’re tasting. The fact that they got such a basic thing wrong – what constitutes a craft beer – is unsettling, especially when it’s explained ON THE SAME PAGE. How do you get 20 dead prostitutes into the trunk of a 2013 Chevrolet Malibu LT with Sunroof Package? What’s the Best Buy in craft beer? Consumer reports only looks smart if you know nothing about the products being reviewed. Given even a casual expertise in the field of the review, they will probably look like asshats. They’re like the guy who knows a little bit about every topic. Expert at nothing. I can’t imagine what the people at the car companies think, especially when they have to re-engineer stuff to make these morons happy. MMMMMMM…Shock Top! That sounds delicious! Does it come in a 40 ounce? Because I want to sit on my front porch and drink it out of a brown paper bag. To be fair, Stone IPA, Dogfish Head 60 Minute IPA and Samuel Adams Hopology Collection Latitude 48 IPA all rate higher than Shock Top’s Wheat IPA. It’s not their Belgian White. The “Best Buy” designation is because it’s cheaper than all the other beers. Thanks, economies of scale! BUT IT’S NOT CRAFT BEER!! That’s the part that kills me – it’s cheaper, etc., and to each their own taste wise, but Shock Top can’t be a craft beer best buy if the beer itself isn’t made by a craft brewer. Also, thanks for the insight on which beer they’re referring to. Thanks Jim! Great article! It is a shame how loosely the word craft is used these days. 10 years ago or so I bought a CR issue, needed a new washer or something. The cover proudly proclaimed “5 best cars under $20k”. One of the cars sticker price was $20,019, or some number thereabouts. I wrote them a hilarious article on false advertising for their “Selling It” section, the last page in each issue. Umm, never got published! Goose Island is wholly owned by InBev as well. I know, Moo, but at least they were a craft brewer that was acquired, as opposed to a fake one created to exploit the burgeoning craft beer marketplace. Not to defend them for including Shock Top as a craft beer, but I’ve found the review and can clarify a couple of point. First, the style reviewed was the Wheat IPA. Second, apparently “Best Buy” does not equal “Highly Rated.” They only gave it 77 out of a 100. There were a number of more highly rated (and actual craft) beers. The highest rated beer was Stone’s IPA, with a 95 out of a 100. And there was a typo there; the Stone IPA scored 94 out of 100, not 95. And Shock Top is still not a craft beer. That was not a typo. Don’t lie! You know you drink Shock Top and Blue Moon when no one is looking! The term craft beer is a joke anyway. Is Sam Adams a craft? they didn’t even brew their own beer for a long period of time. The real interesting part of the story is how well Shock Top Wheat IPA did in their ratings. You didn’t check your sources very well. The reviewed the IPA, not regular Shock Top. Shock top is still not and has not been Craft beer.. no matter the style. Everything about that Consumer Reports post is glaring evidence that their “experts” have no clue about what constitutes good beer. I’ll just pull this quote out of it, “The best lagers are very tasty but not quite complex or intense enough to be excellent”, which is just absolutely incorrect. It is akin to saying white wines could never be excellent, and it ignores the growing trend of a greater appreciation for craft lagers. Thanks for highlighting this injustice, and thanks for the shout out, Jim! Let me know if you ever need a beer writer intern.